Here are a few Mobile Apps and web-sites that can make your TV Watching Experience even better. 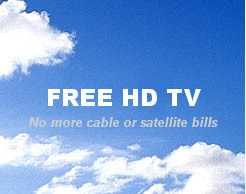 Provides a detailed listing of HD TV transmissions in your area. Input your postal code and select - 'Broadcast'. Click on a given program to see a detailed description of it. Brother of the popular VLC Media Player - it allows you stream from your desktop through your iPad. $2.95 buys the upgraded app that allows you to output through your Apple Cable to your TV. Watch all you have stored on your computer without having to connect it to your TV. Located at 6355 Kennedy Rd in Mississauga - I have been buying my antennas and accessories there from Grace and Karim for over 5 years. They have plenty of choices of antennas from Antennas Direct, Winegard and Channel Master. They also carry all of the great toys and accessories you are going to want to add to your HD TV System. If you don't buy off me - buy off them. If we don't have it - they will. They can also ship to you next day.